Students use the printer to solve real-world problems, like replacing a broken keyfob. Wagaman is excited that students have gone from making simple shapes and parts to printing parts they can use in real life in just a matter of weeks. 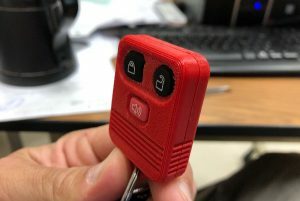 “For example,” he says, “a student’s key fob broke, so he 3D printed a replacement for it—and it worked. Another student made a fly fishing reel. Students are using 3D printing to solve real-world problems and for real-world situations. At this very moment, I’m looking at the 3D printer while it’s printing a lathe chuck for handheld drill,” tells Wagaman. Wagaman with the Afinia H400 and Dobot Magician. Students have even used the machines to help express their thanks. 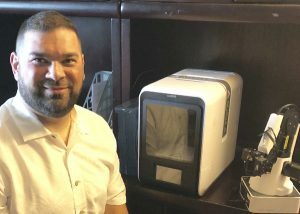 “Several students made a name plaque for the technology person who helped get their 3D printing up and running,” explains Wagaman. “I thought it was such a great project… using their knowledge of technology to express their gratitude.” Having these soft skills can help students go even further than mastering the hard sciences alone. “The Dobot Magician has been more challenging for students than the Afinia H400. It has really encouraged them to learn to code, without them even realizing they are learning coding!” exclaims Wagaman. Students create gifts for loved ones using the Dobot Magician. 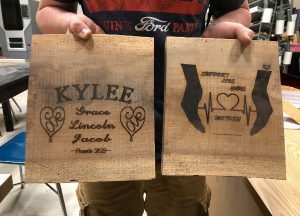 “They’ve been very interested in laser engraver aspect of the Dobot,” Wagaman states, saying the timing of having access to the robotic arm worked out perfectly, with many students using it to make wood engravings for their moms for Mother’s Day.